OFTEN DESCRIBED AS INFORMATIVE, entertaining and equally fascinating by visitors, the “little gem”, Arlington House Museum, located in Speightstown; St. Peter offers a unique opportunity to the intrigued soul. This house, originally the home of a wealthy merchant, was of a classic “single house” design. Due to the connection Barbados had with the United States of America (USA), similar buildings could at one time be found in Charleston, South Carolina. Upon arrival, be prepared to experience life in a “bygone era” as the museum’s history is contained in a restored eighteenth century three-storey building. The architectural spectacle was reportedly constructed using cement paste made from egg whites and molasses to fuse together coral, limestone and rubble masonry. Today, it boasts of walls over two feet thick. With stories of sugar, seafaring and trade, each floor of the museum carries a different theme. And if you’re planning to take your children to the antique site, the possibility of becoming bored is slim to none as the interactive and audio visual features ensure an educational and engaging occurrence for the entire family. The ground floor, Speightstown Memories, provides an insight to the lives of its early citizens. The second floor, Plantation Memories, tells the story of colonization and the sugar cane industry on the island. While the third floor, Wharf Memories, is especially a treat for children as a talking pirate takes you on a historical journey of Speightstown as a leading hub and port. According to the Visit Barbados website, a beautifully produced film also gives an overview of Barbados, from its geological origins to the present. Moreover, the showcase emphasizes the importance of Speightstown and Arlington House Museum by extension to Barbados’ history. Additionally, it tells of the role Barbados had in the slave trade as the island was the first destination that was reached on the journey from Africa. NESTLED UNDER THE CLIFFS at the Northern tip of Barbados in the parish of St. Lucy, the Animal Flower Cave is deemed an attractive package of geology, local history and stunning sea activity that will treat all nature lovers to an extraordinary experience. Its remote location sparks intrigue and the remaining artifacts on sight, including the braces in the coral ceiling where the lanterns once hung, give an indication of life in Barbados yester-year. 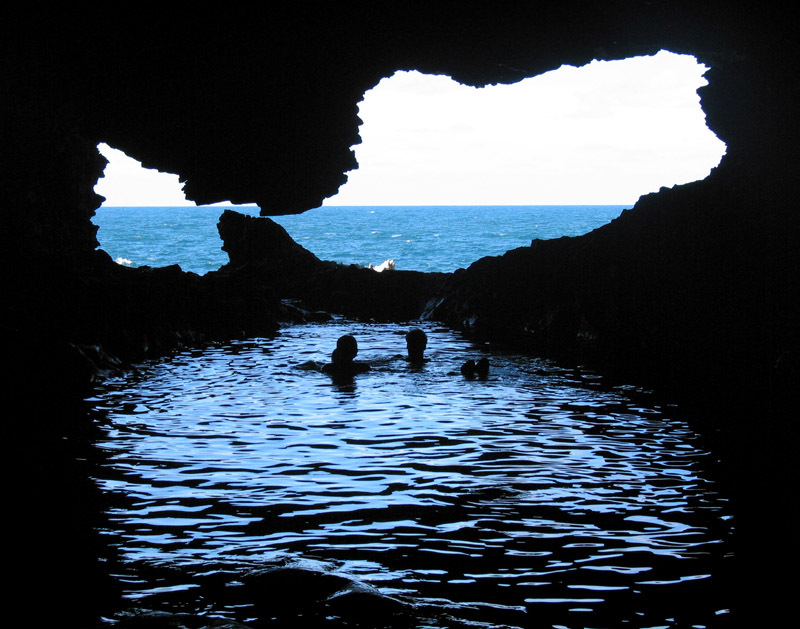 Known as the lone accessible sea-cave in Barbados, it was discovered in 1780 by two English explorers. According to the dating carried out by the German Geographical Institute, the cave’s coral floor is estimated to be 400,000 to 500,000 years old and the ‘younger’ coral section above the floor is about 126,000 years old. Today, the cave stands some six feet above the high tide mark even though it was formed at sea level. The huge coral steps leading down into the cave were built around 1912 and further down there are sea-anemones, locally called ‘animal flowers’, from whence the cave got its name. The flower consists of tentacles that can sting and paralyze a passing fish in the larger variety of species. The tentacles retract into the stalk or stump for safety on contact with an alien object like a stick. The flower then waits a while before coming out of the stalk again to allow danger to pass. The swimming pool, as it is called by the guides, is located in a chamber and the completely transparent and absolutely still water does not reveal its true depth but looks deceptively shallow. The smooth floor of the cave worn down by the water and the rubbing action of the coral rocks over time has an undulating formation and the light lends a magical quality to this chamber. The walls of the Cave are full of fascinating formations which have been coloured green and brown by oxidation of copper and iron. At certain times of the year and in bad weather the caverns become filled with water and the entrance acts like a giant blowhole. On calm days you can swim in the natural rock pools in the cave or perhaps take a look at the stunning views of the Atlantic Ocean through the windows to the ocean (cave openings). 1751 will always be engraved in the rich diverse history of Barbados. For it was in this year that George Washington’s half-brother Lawrence extended an invitation to him to accompany his wife, Anne, and then four-month old child on a trip. Thus, on November 2, 1751, the Brigantine Success landed in Barbados and the Washington brothers made their way to the city of Bridgetown. Previously, Lawrence fell ill with a cough in 1749 and by 1751 the illness matured into tuberculosis. After several unsuccessful trips with the hopes of remedying his condition, Lawrence sought to explore other options and learned about Barbados and its reputation for treating lung diseases. Upon arrival, they realized that Bridgetown was one of the large cities in the British Atlantic. Settled in 1627, Barbados became one of England’s most profitable colonies through a booming sugar trade. Subsequently, George and his ailing brother resided in a historic plantation house, also known as Bush Hill House for two months. 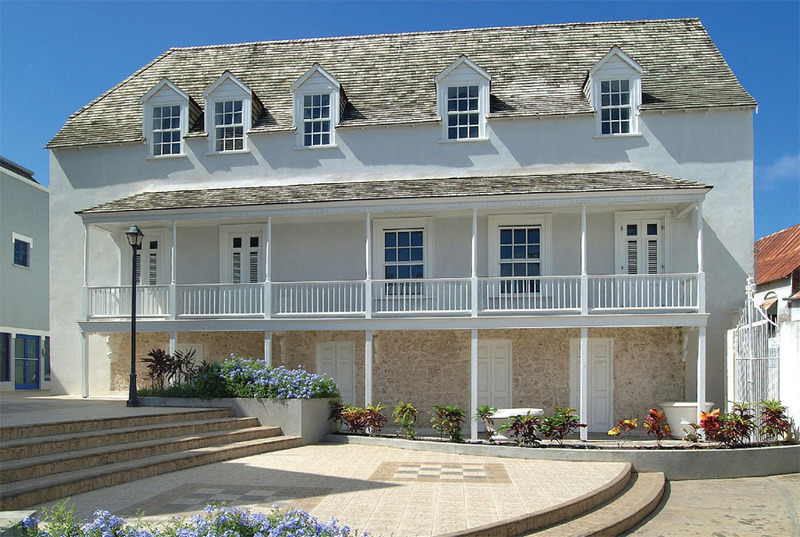 According to the George Washington House official site, Barbados was the only country ever visited by the future First Father of his country and Bush Hill House was the only house he ever lived in outside of the Continental United States. During their stay, the brothers experienced “disaster-filled weeks” whereby Lawrence found the oppressive heat miserable and the venture failed to improve his condition. While George’s situation worsen as he was stricken with small pox on November 17, 1751 as a result of not developing immunity to this disease in his youth. Fortunately, the then 19 year old recovered quickly and eventually set sail home for Virginia in December. Amidst this, Washington’s trip to Barbados had a significant impact on his life. He explored the economics of sugar cane and the role of Barbados in the Atlantic economy, no doubt influencing his approach to Mount Vernon’s plantations. Additionally, he explored the forts and military structures of the island. When he returned to Virginia, he placed a renewed emphasis on his role in the military. Washington sought a commission in the regular British Army while engaging in evening conversations with high-ranking military officials. While this experience undoubtedly fostered his desire to enter the military, Washington’s sojourn to Barbados had a greater impact. During the Revolutionary War the colonial army was ravaged by smallpox and having been exposed to the disease in Barbados, Washington was immune and managed to avoid suffering from this illness like his troops. Additionally, it was under Washington’s watch that his men were administered one of the earliest known inoculations against smallpox. 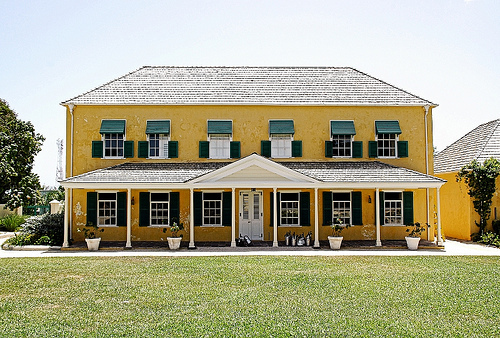 Today, the Bush Hill Tourism Trust Inc., in collaboration with the Barbados National Trust, has restored, what is now the George Washington House, previously Bush Hill House, and outlying buildings. This initiative has created a heritage site on the historic Garrison that celebrates the visit and the role Barbados played in the settlement of America. One of the biggest sporting events in Barbados, the Sandy Lane Barbados Gold Cup will take place this Saturday (March 8, 2014) at the Historic Garrison Savannah and will attract many visitors from all over the world. Since its inception in 1982, the Barbados Gold Cup aimed to be the most prestigious horse race in the Caribbean and today it boasts such an honorable title. Contested over a turf course at a distance of 1,800 metres, this race is open to horses, age three or older. Having been sponsored for the last 18 years by the world renowned Five Diamond hotel, Sandy Lane, this endorsement has lead to the event now seeing entries from not only the Caribbean but also from some of the world’s leading investors in the USA and Canada. For instance, this year’s Gold Cup – the 33rd edition – will have some American flavour as racing tycoons Kenneth L. and Sarah Ramsey, winners of the 2004 Eclipse Award for outstanding owners, are among three owners who will compete. Major Marvel will represent the United States, while the other two are Trinidad and Tobago’s Nominee, owned by Antonio Navarro, and local horse Daga from Blue Diamond Racing. 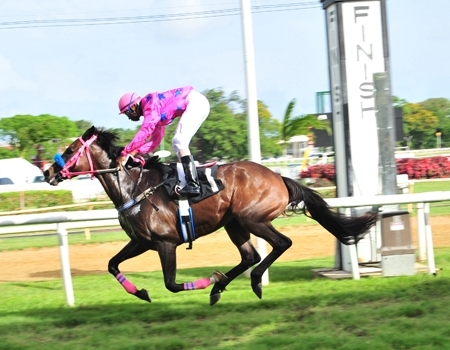 Those three horses are among ten others that were nominated at the offices of the Barbados Turf Club. It would be fair to conclude that the magnificent Gold Cup which is won outright by the winning owner is amongst the most sought after trophies in the world. On February 14, 2014, Minister of Sport Stephen Lashley and the general manager of Sandy Lane Barbados, Randall Wilkie, met the British Airways crew at the Grantley Adams International Airport to receive this year’s Gold Cup, the symbol of local horse racing prestige. And even though the Gold Cup is an international event and streamed to a worldwide audience, its Barbadian flair remains with many local jockeys, trainers, owners and horses crossing the winning line over its 25 year history. While on the big race day, patrons are treated to pomp and ceremony in a carnival-like atmosphere with a series of activities including live music, a Gold Cup Parade and of course, scrumptious food. So without further ado, see you at the races!